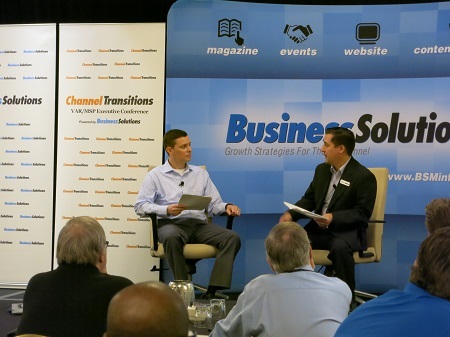 To open the Channel Transitions VAR/MSP Executive Conference, powered by Business Solutions, on November 5 at the DoubleTree Orlando Airport, Jim Roddy, president of Business Solutions, asked editor in chief Mike Monocello to share his insights on the managed services business model. Monocello, who has more than 12 years of channel experience, discussed trends, common mistakes he sees managed services providers (MSPs) make, and benefits of the as-a-Service business model. Monocello said a significant trend is increased adoption. Although the as-a-Service business model is nothing new to IT solutions providers in the networking space, there are now more VARs from other areas — such as retail, telecom, and document management — that are providing managed services. “If you are currently an MSP you realize there is competition, but what you might not realize is all of the new people entering managed services. There will be increased competition,” he said. As Monocello listed benefits of providing managed services, including recurring revenue, increased profits, and stickier client relationships, he said one of the most important reasons to transition to the business model is increased business value. “The key is recurring revenue,” he commented. According to Monocello, approaching the business model half-hearted is a mistake: “You don’t need to make managed services 100 percent of your business or shoot for 100 recurring revenue — although that would be great for your business — but what I mean is not fully buying into the business model and adopting all the tools like a PSA [professional services automation] and an RMM [remote monitoring and management].” He explained that the proper tools are necessary to better understand your business and how to operate it effectively. Click below to listen to Roddy’s interview with Monocello. For more information on the Channel Transitions VAR/MSP Executive Conference, visit www.ChannelTransitions.com or email Events@BSMinfo.com.